Summer is coming! Are you ready to entertain guests with your outdoor kitchen and dining area? Cooking up a great outdoor kitchen is easier than you think. Your outdoor kitchen can have the same options as your indoor kitchen, giving you the convenience you experience with your indoor kitchen amenities. As long as items are waterproofed like stainless steel, stone or ceramic, you can corporate kitchen cabinets, counter tops, grills, refrigerators and even fireplaces in your new outdoor cooking and entertaining area. What will you be cooking on? BBQ grills are the more popular choice of cooking outside. But you have other options. One easy method of cooking and providing a cozy focal point for your guests to gather is an outdoor fireplace. How about an outdoor oven in your kitchen? A brick or stone pizza oven maybe a better choice to consider for your outdoor cooking. Something more on the casual side would be a fire pit or a grill over an open flame. Storage is beneficial for your outdoor kitchen. Being an outdoor room, you would need to invest in waterproofed storage cabinets. You can build your storage area with woods that are resistant to weather exposure, or go with the stainless steel or ceramic to add protection and elaborate content to your outdoor kitchen. 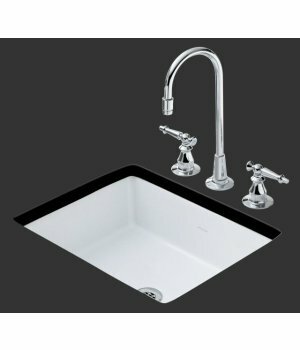 Kitchen sinks are always in need while cooking in your outdoor kitchen. Outdoor sinks can be hooked up to your homes main water line or simply attached to a garden hose. The best sinks for outdoor use is to go with stainless steel or ceramic materials. Simple entertainment sinks will do the trick on keeping your outdoor utensils and cooking accessories clean. 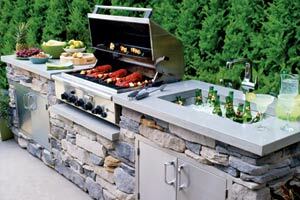 Counter space for your outdoor kitchen would be helpful in preparing your delicious meal. You can also give your outdoor space an eat-on counter. You can us stone or ceramic tiles and other materials that would substain the outdoor elements. Materials like granite, slate, stainless steel, brick, and stucco would be a good pick for your outdoor countertops as well. These materials would also be great for tile flooring in your outdoor kitchen and dining area. Add some useful appliances to your outdoor kitchen. Implement a stainless steel gas grill with a rotisserie, a smoker box for wood chips, and storage below. To save spaced, in your kitchen install an under-counter refrigerator. Other popular appliances include wine coolers, ice makers, and warming drawers. Imagine this summer enjoying the warm sun and the summer breeze while you prepare your meals and give your guests an outdoor entertaining room. With the right weather proofing and durable materials, your outside kitchen can be your favorite room this summer.